Vignalta can lay claim to having been a pioneering estate from a quality point of view, both by planting high-density vineyards on the highest and finest slopes of the region’s hills and by vinifying the grapes with a meticulousness and ambitions that were hitherto unknown, not only in the Euganean Hills but also in many other wine-producing areas of Italy. Today the estate continues to produce wines that seek after absolute excellence, the result of a great viticultural heritage expressed – from south to north – in all of the principal terroirs of the Euganean Hills as well as of modern winemaking practices carried out in a masterly and consciously careful way. The family estate Alois Lageder is a synonym for the highest standard of quality in viticulture and winemaking, for a sustainable, holistic corporate philosophy, and for a wide spectrum of cultural and artistic activities. Founded in 1823, and now directed by Alois Lageder and Alois Clemens Lageder, representing the fifth and sixth generation of family ownership, the estate combines tradition and innovation. Our portfolio of wines is divided into three groups: The Classic Varietals, The Terroir-Selections, The Farms; A selection based on both the quality of the wines and their origin. For Alois Lageder and his winemaking team, the aim and impetus for the Cantina Riff project is to produce premium quality wines — a Pinot Grigio and a Merlot-Cabernet blend — with distinctive character and style, unquestionable quality and extraordinary market value. The Riff project began about ten years ago as a négociant-operation by the acclaimed Alois Lageder winery. The Elena Walch Winery is a model of sustainability known for two beautiful estate vineyards – Kastelaz and Castel Ringberg. In 1985, Elena Walch left her career in architecture to become a winemaker and has since become a rising star in one of Italy’s most prestigious wine regions. Elena embarked upon this new career after marrying into one of the oldest wine families in Tramin. Now known as “The Queen of Gewürztraminer”, Elena along with her two daughters, Julia and Karoline, are committed to high standards and sustainable winemaking. 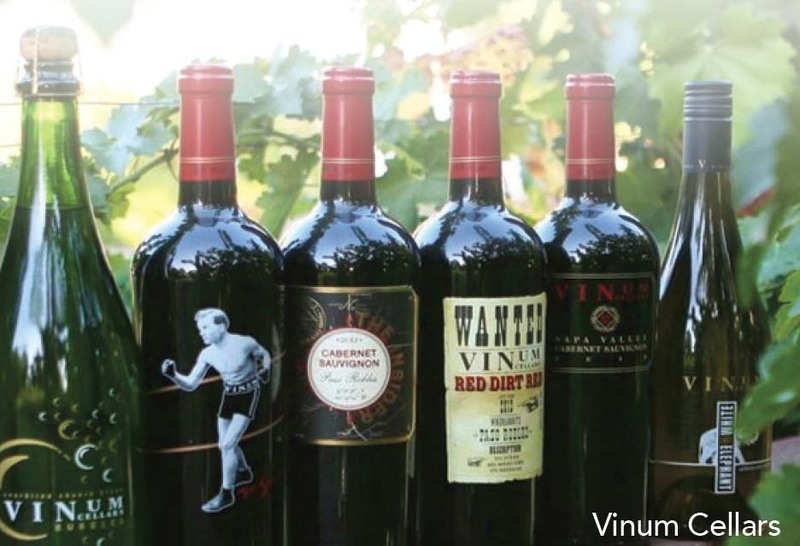 Vinum Cellars was founded in 1997 by first generation, California family winemakers Richard Bruno and Chris Condos in the Napa Valley financing their dream on credit cards. Their focus was then, and remains searching California’s coastal vineyards and special microclimates in search of the best vineyards grown by the states best growers. 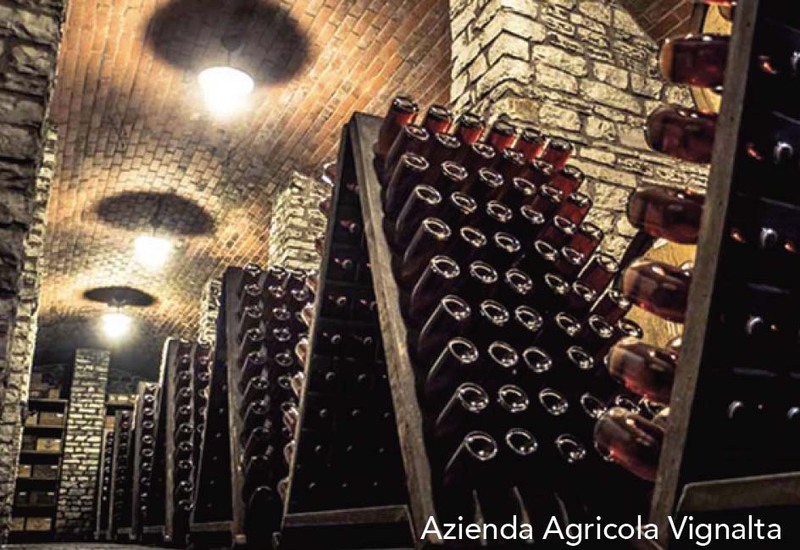 The long-term partners consider their humble roots in the development of products and mandate that each wine offer considerable high quality-toprice ratio. What this means is each wine is literally hand crafted from single vineyards and made with a small lot philosophy. From Coastal Chardonnay and Pinot Noir to Napa Valley Cabernet Sauvignon, Vinum makes varietal wines from single vineyards and appellations throughout California. Our basic winemaking philosophy is to work with great grape growers to develop the best fruit in the vineyard. We pick the grapes at optimal ripeness and gently process the fruit. We are very experimental with yeast strains and use different cultures for each variety.Our whites are barrel fermented slowly and aged Sur Lies in small French Oak barrels. With our reds, skin contact is optimized by the use of small open top fermentors, hand punch downs and extended maceration before pressing. Our belief in the use of older French Oak barrels allows the varietal fruit of our wines to be expressed. We are committed to experimenting and learning new winemaking methods while preserving an old world approach. Vinum Cellars is a California Brand, we have long term contracts with grape growers all over California. We search the best areas for the specific varieties, and the fruit is grown to our specifications. We source our fruit form the following appellations: Clarksburg, El Dorado County, Napa Valley, & Calistoga. Brilliant straw-yellow color with a green tint. Fine, fruity (apples,peaches), forward varietal aromas. Pronounced, clean, elegant, grapey flavor. Light to medium-bodied with a fresh mouth-watering finish. Dry and crisp. Pair with white fish, salads, pasto, risotto. Produced with Merlot and Cabernet Sauvignon grapes grown in our Mount Venda vineyard. This is a bright ruby wine, not overly tannic, fruity and elegant for everyday drinking. Good balance of acid and fruit. Raspberry on the nose. It pairs well with both white and red meats, as well as medium-aged cheeses. It is a brilliant straw-yellow color with a green shim-mer. Very aromatic, opulent, uplifted varietal aroma paired with pronounced mineral notes and elegant oak spice. Grapey, fullbodied flavor, quite soft and creamy, refined and with a fresh finish. Remarkably long and aromatic on the palate. Pair with starters, pâtés and terrines, cold meat, all kinds of fish and seafood, white meat and poultry. This Rosso Riserva is made with a blend of Merlot and Cabernet grapes and is the true expression of the Colli Euganei terroir. Color is a deep dark red. Has a nice balance between fruit (dark berries, figs) and tannins with a hint of herbs. Softened with two years of oak barrel aging, gives it a well-balanced, medium body. It pairs with white and red meats, in particular venison, beef, or lamb. Color is a deep garnet red. The bouquet is mildly spicy with berries and cherries. Taste of spice and earth; flavors of fruit, berries and cherry, with a hint of vanilla. Medium tannins provide for a medium finish and a well-balanced wine. Pairs nicely with meat or mushroom based main dishes, pasta, or rice dishes. The heights of Veneto and long ageing in small French oak barrels make this an elegant wine that is served in the best restaurants around the world. Color is ruby red. Nose is complex with balsamic, woody, floral, and fruity scents. Full-bodied and dry with woody undertones. Fruity with tastes of cherries, blueberries, cocoa, and oak. Also a note of earthy, wet leather. Pair with game, pasta dishes, beef, or lamb. Gemola, Italian for “Little Jewel”. The perfect exposure and unique composition of volcanic soil provides this wine with delightful fruity layers, plums, dark berries with a smoky, earthy taste. Fully integrated, rich tannins. A very structured wine, aged in new French oak barrels that gives this wine a certain wow factor. Pairs with olives, capers, prosciutto, beef game, or lamb. Alto Adige is positioned right below Austria at the tiptop of Italy, Alto Adige lies in a ‘Y’ shaped glacial valley. Before planes, this little valley used to be the main passage between Italy and the rest of Europe. Because of its position as a gateway to Italy, Alto Adige was the focal point of conquest from the ancient Romans to the Nazi regime. 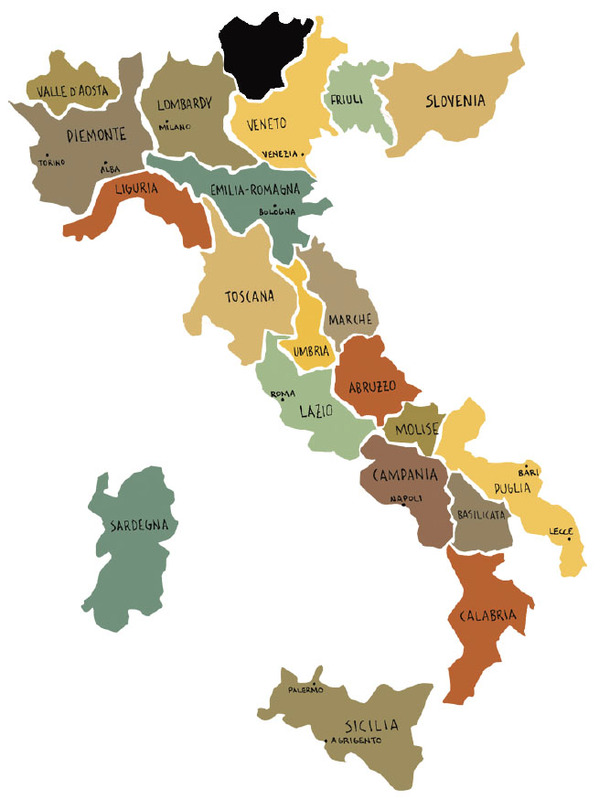 It became part of Italy in 1919 and there are up to three official languages: Italian, German and Ladin. Vineyards in Alto Adige creep up the sides of glacial valleys in horizontal rows. The winery estates here are commonly called “Schloss” which is the German word for castle or chateau. Alto Adige is quite tiny at only 13,000 acres but the region varies enough to have 7 distinct growing sub-regions. The city of Bolzano is smack-dab in the center of Alto Adige and has some of the most amazing scenery. Variatels grown here included Schiava, Lagrein, Pinot Noir, Merlot, Cabernet Sauvingon, Pinot Grigio, Gerwurztraminer, Chardonnay, Pinot Blanc and several others on a small scale. Pale steel color with a glint of light straw. Aromas are tropical with guava, jasmine and clov. Palate, the wine is juicy with citrus flavors from blood orange to Meyer lemon and verbena. The citron finish has strong acidity which fades nicely in the finish. Pairs with oysters, salads, whitefish, or thin crust fungi pizza. Ripe with blueberry and boysenberry fruit which are elegantly wrapped in a silky vanilla wrapping. The entry of this dense Petite is both tannic and bold while maintaining a juicy, overripe profile displaying ample acidity to balance the tannins and fruit concentration making it multidimensional and food friendly. Pairs with red meat, aged cheeses, or pasta. Medium straw color. The aromas display tropical top notes from the Clarksburg Chenin Blanc such as mango and lychee, but then is backed by apricot and clove courtesy of the Paso Robles Viognier. The palate has a slight toasted oak note and then becomes slightly creamy while opening up with its ample acidity. Pairs nicely with fresh oysters, crab, grilled fish, mildly spicy chicken curry. Medium ruby in color. This very aromatic Pinot Noir displays ripe crushed bing cherry fruit with raspberry and integrated vanilla notes. On the palate the fruit notes carry through with cherry, rhubarb and raspberry linzer tart flavors. The acid levels are balanced with the fruit and oak levels and make for a pleasing stand alone wine and a welcome companion to many fine meals. Pair with roasted game hens, aged cheeses, red meat, and eggplant. Medium plum colored Rhone red blend. Complex and layered with spicy aromas and flavors. This wine has dark, dry cherry notes and is backed with toasted, charred oak notes which transition seamlessly to a silky leather texture and then is wrapped by black cherry flavors. The wine finishes with spice rack flavors including cinnamon, clove and cardamom. Pairs with traditional Cassoulets, red meats, tabouli, and hummus. Deep, dark plum color. Aroma, intense blueberry, cassis, and huckleberry aromas, with notes of cinnamon. On the palate the wine is silky in texture and then rolls into the varietal “franc” spice which is best described as fresh picked wild currants. The wine then displays it’s silky and elegant tannins in the form of bittersweet chocolate, dark roast coffee and black cherry with integrated vanilla. Pairs with red meat, like braised short ribs, aged cheeses, red sauce based pasta. Color, deep, inky purple colored with a plum hue. Aroma, rich cassis and crushed cherry nothes with subtle cinnamon spice. It’s incredibly concentrated with dense black cherry fruit, big, silky tannins and very structured. The complex finish shows nice acidity and appropriate acidity with juicy boysenberry and black cherry coulis flavors with subtle cigar box notes and then back again to cassis and boysenberry. Pairs with prime cuts of beef, eggplant moussaka, green lentil dal. In 1848, gold was discovered at Sutter’s Mill on the South Fork of the American River. Located in the foothills of the Sierra Nevada Mountains, El Dorado County became the destination for legions of people, who arrived to find their fortunes, many originally from Europe. Miners planted vineyards almost immediately, and by 1870, El Dorado County had about 2000 acres of vines. Zinfandel and Barbera were some of the earliest plantings and later Syrah. But the gold bust and finally Prohibition destroyed viticulture until a resurgence of interest in the late 1960s. With a huge array of microclimates, vineyards are planted at elevations between 1200 to 3500 feet with cooler areas at higher elevations and warmer ones in the valleys. Breezes floating down from the mountains provide the crucial cooling influence, extending the time that grapes can hang on the vine to develop flavor. Home to over 70 wineries, the main American Viticultural Area is El Dorado County, but part of the sub appellations, Fair Play and Shenandoah Valley cross over into the County. 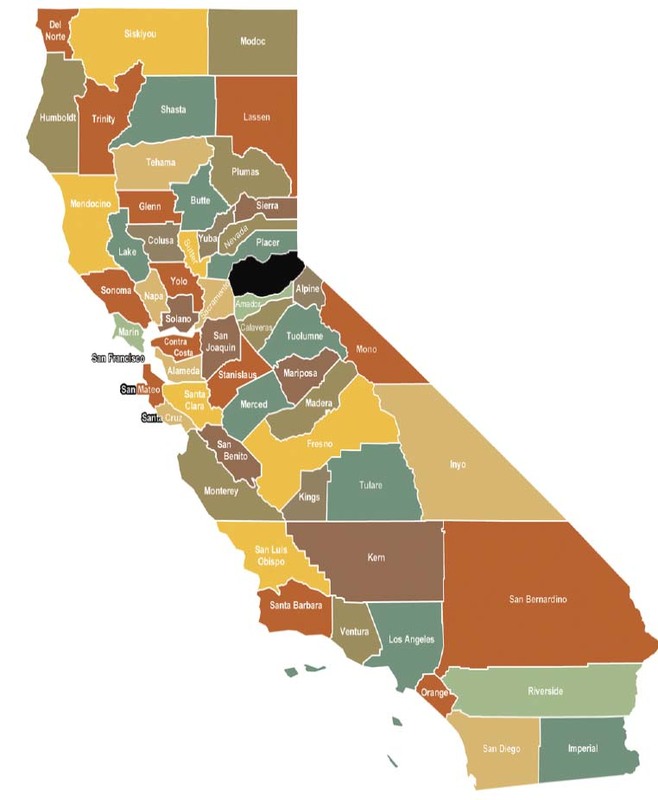 The Sierra Foothills AVA, one of the largest in California, includes all eight Foothill counties. I recommend the 2014 White Elephant. The simple acidity should pair nicely. Whisk all dressing ingredients together and let stand for at least 30 minutes. I recommend pairing with the 2016 Vignalta Venda Colli Euganei. In medium saucepan cook onion and celery in butter over medium heat until soft. Stir in flour, salt, mustard, pepper. Cook, stirring until bubbly. Remove from heat, gradually blend in milk. Cook, stirring until thickened. Add half your cheeses, stirring until melted. Remove sauce from heat. Fold in crab and eggs. Spread mixture in greased shallow 1 ½ quart casserole pan. Spread remaining cheeses evenly over top. Bake, uncovered at 400 degrees until heated through, browned, and bubbly, about 10 to 15 min. Enjoy!